Welcome to the Dinwiddie Presbyterian Church website. We are glad you have chosen to visit our site. We hope you will choose to visit us in person in the future. 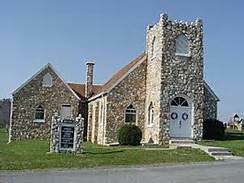 Our church is located in the Mitchell's Crossroads community of Carroll County in Southwest Virginia. Our church has existed for more than a century and has become a historical landmark in our area. For further information about our past, please refer to the History section. The building is very beautiful and is open to guests and visitors at all times. We especially invite you to join us in worship on Sunday mornings. We have Sunday school classes for all ages beginning at 10:15 AM followed by a worship service that starts at 11:30 AM. If you are new to the area and are looking for a new church family, please review the Programs section for information on regular activities and opportunities for fellowship and growth. If you are in the area for the Annual VFW Gun Show and Flea Market, staying at one of the local campgrounds, or just passing through, please feel free to worship with us even if you didn't pack your usual Sunday best. You will find our small congregation warm and eager to share the love of Jesus as we fellowship and worship our God together. We welcome you as a visitor to our church. It is our prayer that you draw near to God while you are here! You will find that this church has a brief but very charming history. We were organized as a congregation on October 31, 1897. The church is named in honor of the Rev. Dr. Dinwiddie, a Presbyterian evangelist, who made it his life's work to organize churches during Virginia's early years. Dr. Dinwiddie was one of a number of Presbyterian pioneers in education as well as Christianity in Virginia. Dinwiddie Presbyterian Church did not begin in the present building. The church began outside under a pine grove in what was then known as the Cook Community in Carroll County, Virginia. A small group of Christians gathered every Sunday on benches under the pines to worship God. They were guided by their first preachers: Dr. George Gilmer, Dr. Riff, and Mr. Jake Lindsey. This pine grove was located where the picnic shelter (to the left of the church) now stands. The members came from Hillsville, Sylvatus, and all over the Pine Creek area of the county. They had no musical instruments, but their singing was still said to be more beautiful than any organ music. Sometime after the church was organized, Mr. Steve Mitchell bought a small organ which was brought to the pine grove every Sunday morning for the worship services. The people decided to build a combination church and schoolhouse around the turn of the century. 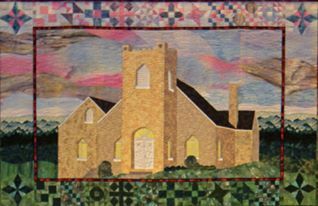 The early congregation which Dr. Dinwiddie brought together in 1896 represented three denominations: Methodist, Christian (Disciples), and Presbyterians. When the first building was destroyed by fire, another building was erected on the same location. 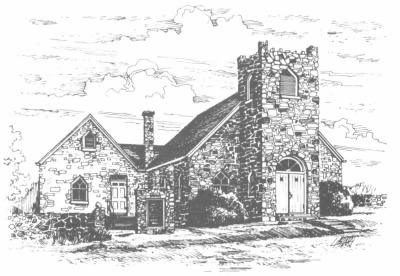 Dinwiddie Presbyterian Church struggled to survive in those first years, and was often without a pastor. But God provides. The Rev. 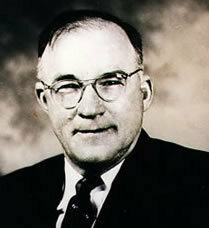 Robert W. Childress came to Dinwiddie in March of 1946. The offering that was received on the first Sunday Mr. Childress preached was offered to him for his services. It was a grand total of $5.60. Mr. Childress suggested, "Take this and start a building fund for a church." Small though it was, it grew with the encouragement of Mr. Childress. Our current building is the result of his leadership, as well as some sacrificial giving by many members of this church and of the community. Dinwiddie Presbyterian Church is one of six stone churches that Mr. Childress built. The people of this church and the building itself were his pride and joy. Construction of the sanctuary was completed, and the dedication was held on September 6, 1953. Plans were made and construction began on three additional Sunday School rooms in the fall of 1956. The church then built the manse (a home for the pastor) on the old schoolhouse lot across the road in 1958. The land was purchased from the Carroll County School Board in October, 1953. This church has grown over the years. We offer an exciting ministry that includes Sunday worship service, Sunday School for all ages, monthly women's meetings, and special services at Easter, Thanksgiving and Christmas. Our worship service begins at 11:30 every Sunday morning. All are invited to attend. We have accomplished a great deal by the grace of God. Dinwiddie Presbyterian Church stands under the Great Commission of our Lord Jesus Christ (Matthew 28:18-20). To describe our form of church government, we are Presbyterian. This comes from the Greek word presbuteros which means "elder". Our form of government is representative. The local congregation elects members who exhibit Christian maturity and wisdom (see I Timothy 3:1-7) to rule as elders over the local church. The elder shares ordained office in the church, that of spiritual overseer, with the minister (who is known as the teaching elder). Presbyterian government expresses itself in a hierarchy of church courts that serve the local, regional, and national levels. Sola Scriptura: Scripture alone. The Bible, the 66 books of the Old and New Testaments, is the inspired word of God. It is the complete revelation from God of what is necessary for salvation. A Christian's conscience cannot be bound by the opinions of men or of human cultures but only by the word of God. The Bible is our final authority in all matters of faith and practice. Sola Gratia: Grace alone. God's redemption in Jesus Christ is not based on any merit on our part but solely on His grace and mercy (Ephesians 2:8-10). The Bible teaches that we cannot resist God's grace. Saving grace is the work of the Holy Spirit in which He draws us to rebirth and eternal life at the hearing of the Gospel. Sola Fide: Faith alone. God's grace is revealed only through faith in the person and work of Jesus Christ our Lord, fully God and fully man, yet without sin. Faith is expressed by trusting Jesus Christ and His perfect work on our behalf by His death on the cross and by His bodily resurrection from the grave. At the cross Jesus made complete atonement for all of our sin and rebellion against God and each other, and by His bodily resurrection from the grave He conquered the power of sin and death for us. Only by faith in Jesus Christ is our sin forgiven and we are declared God's adopted children (John 1:12-13; Romans 10:9-11). There is one God, [Father, Son, and Holy Spirit], three persons in the one Godhead. God is the Creator and Sustainer of all things. He can do all things which are consistent with His holy nature and will. God is Sovereign over all nature, history, human endeavors, relationships and culture. In the fullness of time, God the Son, being conceived by the Holy Spirit, was born to a virgin, Mary. Our Lord Jesus Christ, fully God and fully man, yet without sin, took on our nature, endured temptation, and performed miracles which attested to His deity. By His death on a Roman cross He paid the punishment for our sin and by His bodily resurrection from the grave He conquered sin and death for us. He rules over heaven and earth at the right hand of God the Father and is the high priest and mediator for His Church. He will come again, visibly, on the Last Day, to gather His Church to Himself as His bride and will bring the world and the devil to judgment. The Holy Spirit is present in the world and is the Counselor and Comforter who indwells all who have been born-again. His role is to convict us of sin, comfort us and teach us all things through His illumination of the Scriptures, intercede with us in our prayers, and to impart gifts to each believer for the work of ministry. Humanity, due to the fall, is sinful by nature. Only by the grace of God, through faith in Jesus Christ, is our sin forgiven and we are made right with God. There is one Holy Catholic Church in heaven and on earth. It is not defined by any particular outward organization or institution but consists of every man, woman and child who, throughout the ages, confesses Jesus Christ as Lord and Savior. There are two sacraments which Christ instituted in the New Testament; Baptism and the Lord's Supper. These are the fulfillment of, and correspond to, the Old Testament ordinances of circumcision and the Passover. Baptism is administered by sprinkling, libation, or immersion to believers and to the children of believers (Acts 2:38-39). We hold that the Lord's Table is open to all who have been baptized and confess Jesus Christ as Savior and Lord, regardless of their denominational background. Through His apostles Jesus has commissioned His Church to proclaim the Good News of His salvation to every nation, race, tribe, and tongue and to teach all that He has commanded (Matthew 28:18-20). Obedience to the Great Commission is the great work of the Christ's Church at all times and in all places. Take VA-100 South for 13.4 miles, turn left onto Deer Ridge Road (VA-783), continue 0.6 miles, turn left onto Mitchells Crossroads (State Route 752), continue 2.1 miles, turn right onto Homestead Road (State Route 750), arrive at the church located on left. Take VA-100 North for 3.8 miles, turn right onto Deer Ridge Road (VA-783), continue 0.8 miles, turn right onto Mitchells Crossroads (State Route 752), continue 2.1 miles, turn right onto Homestead Road (State Route 750), arrive at the church located on left. 10:15-11:15 AM Classes for all ages are provided each Sunday. 11:30 AM each Sunday morning. Food drive each second Sunday benefits the local Food Pantry. Available during Sunday morning worship and special services. A women's group for all ages that meets once a month for Bible Study, for planning church activities, and for packaging Backpack Buddies for two schools. Held annually at 7:00 AM. Followed by breakfast cooked by the men. Regular worship service at 8:30 AM. Held annually for spiritual renewal of church members and the community. Held annually in September. This is a time to gather with friends and former members for worship and a fellowship meal. Decorated annually during the month of November with unwrapped gifts for the local homeless shelter. Held annually on Thanksgiving morning at 9:00 AM. Short, informal come-as-you-are service for all who wish to attend. Held annually in December. Come early to get a good seat. Thanks to all of you who have been so faithful in sending donations. Donations help us to keep our bills current, make improvements to the building and grounds, and allow us to give money to those less fortunate than ourselves through our 20% Mission Fund. For every dollar Dinwiddie receives, 20¢ is set aside for this Mission Fund. In this way, your donation helps others outside Dinwiddie Church. The Mission Fund has helped buy medicine, food, and heating assistance for many people over the years. At least one orphanage benefits from the Mission Fund on a monthly basis. The Mission Fund also reaches around the globe through Dinwiddie's support of the Medical Benevolence Foundation and the Outreach Foundation. These are year-round expenses at Dinwiddie and your donations truly bless us. All donations to Dinwiddie Church are tax deductible. Tax letters are mailed to all donors each year before January 31 of the following year. the grace of our Lord Jesus Christ be with you. Greetings from Dinwiddie Presbyterian Church. We are a small but growing congregation nestled in the Blue Ridge Mountains outside of Hillsville, Virginia. Our members are strong in their devotion to our Lord, ready in their testimony to His constant grace and mercy in their lives, humble in His blessings, and welcoming to all. We invite you to come worship with us on any Sunday when you're nearby. Or come be a part of our many activities throughout the week. We pray Christ's rich blessings on you and those whom you love.